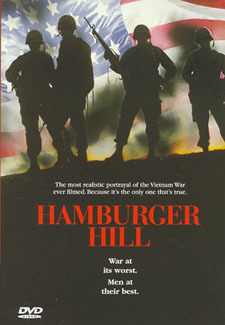 Philip Glass’s swirling, hypnotic music underscores the vertiginous opening shots as the camera speeds rapidly over scenes of the Vietnamese jungle, intercut with shots of the Vietnam Veterans Memorial in Washington D.C.
Director John Irvin who worked on several documentaries in Vietnam in 1969 and writer John Carabatsos, who served with the 1st Air Cavalry Division in Viet Nam in 1968-69 have created a decidedly hawkish film about an actual battle that was the known as the bloodiest battle of the Viet Nam war. The film is magnificently constructed and the battle sequences rival any that have ever been filmed and the cast is outstanding. Had the film makers resisted politicizing their material this would be a great war movie. Produced by James Carabatsos, Marcia Nasatir. Film Editing by Peter Tanner. Production Design by Austin Spriggs. Makeup Department: Cecille Baun, Neville Smallwood. Second Unit Director or Assistant Director: Steve Harding, Nikolas Korda, David W. Rose.